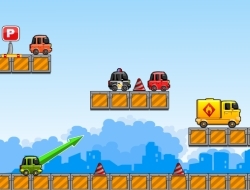 Parking Hooligan is an awesome shooting game but you will not be killing anyone, instead you will shoot the car and hopefully it will cause some collateral damage to the other vehicles in this car game. Your job here is to destroy all the cars and then your car should remain parked in the spot indicated for five seconds until the level ends. There are limited launches you can use with your car so hopefully you will not mess it up too bad to the point where you cannot finish the stage. Have fun with the little car that looks like at any moment, ten clowns would come out of it. Parking Hooligan 0.00 between 0 and 10 based on 0 votes.